Wonder how to get Thunder Lord Ornn? It is available in the League of Legends shop! You can hop right in there and buy it right now and test it! The skin is showcased in the skin review to the right! The new Champion has been unleashed on the Rift – Ornn! 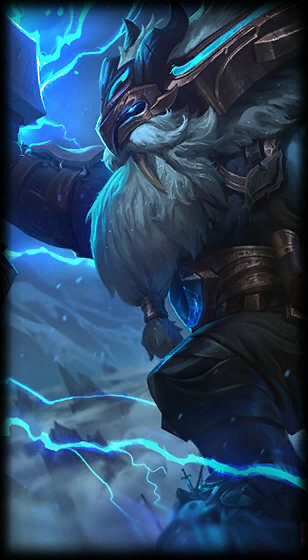 With his release comes his first ever skin as well – Thunder Lord Ornn. Taking inspiration from Nordic Mythology, Ornn takes on the role of the Mythical Forger of the Gods, capable of creating any superhuman, divine weapon as he sees fit. Wielding the power of the Gods, you too can take on the rift with this brand new Champion and make your opponents bow down to your strength! The skin was released on August 23th 2017. If you want to check out the new patch, Lolskinshop can help you, we are selling PBE accounts. Note Lolskinshop.com does not sell this skin, never have, and most likely never will! This page is an information page. We have collected all the different parts needed to create one good page that highlights every part of this specific league of legends skin. We would also like to point out that the only way to ever getting this skin is through the official Riot store, where you buy it for Riot points. There is no point looking for it on Ebay or other third party sites, it simply does not exist! Thunder Lord Ornn skin review and information.